This week’s workout is made up of a couple of drills sent in by Kjell Stoddard Crowe. Kjell was our Featured Designer on BootCraft last month and shared with us 12 drills. 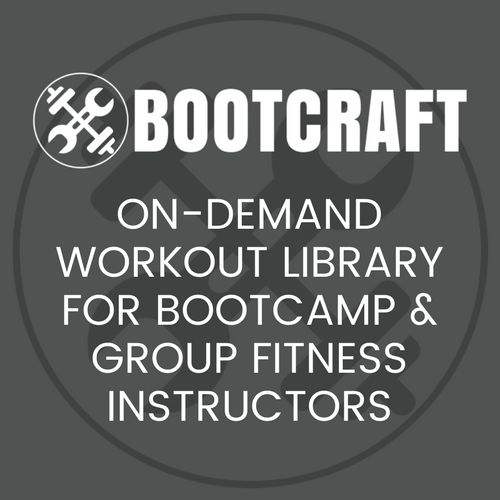 If you’re not familiar with our workout design tool called BootCraft, check it out. Spend 10 minutes with a warm up of your choice. This drill combines a 5x5x5 drill with a Chipper slotted in between for awesome 3 part strength and conditioning workout. To set up the 5x5x5 drills, create 5 stations in a row 5 metres apart. Clients will work from one end to the other, once clients get to the end they must run back to the start. Campers complete all exercises in a row. While I used to run my own outdoor boot camp business, I now am part of a local gym that has me running the class 3 days a week. I have dedicated myself to being a beacon of light in an industry that is body obsessed, ridden with relentless pressure, and confuses people about how they should look , what to or not to eat, or what they should be doing to keep fit. I believe in being healthy and strong, rather than some unrealistic beauty standard shown in the media. I am proud of being able to manage my home/kids and still find time to get out and do the thing I love, which is training and empowering women through health and fitness. BootCraft is kind of like Netflix for bootcamp drills. I created it as a way for trainers to quick search and find a drill that’s a perfect fit for their session. With nearly 400 drills and growing in the database, you’ll be able to give your clients plenty of variety and re-inspire your bootcamp planning brain. Don’t spend hours and hours planning your sessions, sign up here. Hi guys, could you clarify the 5x5x5/ is it five times through the 5 exercises and 5 reps on each exercise? Think I must have that wrong because it wouldn’t take that long?